The media doesn’t make us sick, it just keeps us that way. Eating disorders are on the rise. We know this. We also know that our society is obsessed with beauty; a very limited interpretation of beauty. Everywhere we look, we’re bombarded with images that glorify thinness and youth which has resulted in an epidemic of self-hatred. Kids want to look like adults, adults want to look like kids and both are willing to go to extreme lengths to achieve these unrealistic expectations. Eating disorders don’t care if you’re male or female, under 10 years old or over 50 years old, they’ll destroy anyone who’s ripe for the taking. When I speak at school or to parents about body image, the issue of media manipulation always comes up and for good reason. We are definitely influenced by what we see and hear in our magazines and TV screens, but does the media CAUSE eating disorders? I say no. To say that eating disorders are caused by the media would be simplifying an incredibly complex situation. It’s just not that easy. After having suffered through a very severe eating disorder for 20 years and being lucky enough to find recovery, I can tell you that I still don’t know what caused it and probably never will. I have a good idea of what brought it out, but that’s different from what caused it. Losing my brother when I was 17 years old taught me in the cruellest of ways, that there were things in my life I couldn’t control, as a result, I turned to the one thing I could control; my body. 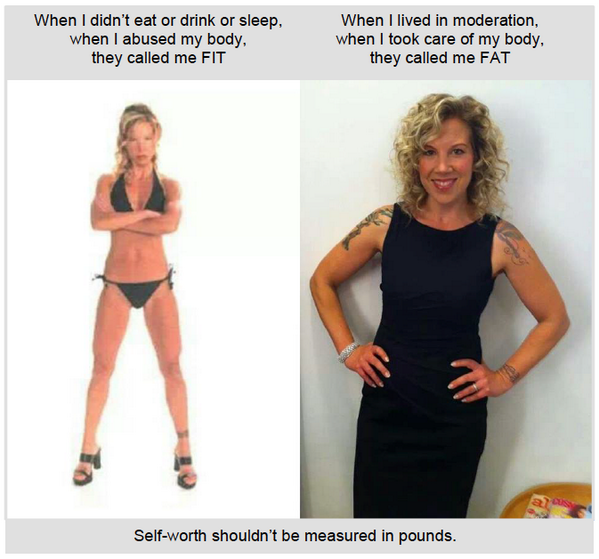 By starving myself, I felt like I had a say in what happened in my life. However, as anyone with an eating disorder quickly finds out, the feeling of control is fleeting and very soon life because even more unmanageble than ever. Why did I turn to food and not drugs or alcohol? I’ll never know. Genetics? maybe. But I stopped asking “WHY?” a long time ago and started asking “WHAT NOW?” and that’s when I started looking for help. Sadly, I found that the hardest part about recovering from my eating disorder was the fact that while I was trying so hard to do everything I could to get healthy, it seemed like the world wanted me to stay sick. THIS is where the media comes in. The media didn’t give me an eating disorder, but it sure as hell made it hard to recover from it. While my family was telling me that I was too thin, magazines were telling me I wasn’t thin enough. While my doctors were telling me I needed to eat to be healthy, diet ads were telling me I needed to stop eating to be beautiful. As desperate as I was to be free of the control my negative body image had over me, I also felt an intense need to look the way society told me I needed to look and this made it very difficult to get well. The constant pressure from the media doesn’t cause eating disorders in the same way that cigarette ads don’t cause Cancer. Don’t get me wrong, cigarettes cause Cancer, but cigarette ADS do not. I could, for example, be bombarded with commercial after commercial glamorizing cigarette smoking and I would not be the least bit affected by them. Someone else, however, could see the same ads and find the urge to smoke incredibly hard to resist. For some people, the commercials can create a desire to buy the cigarettes and by buying and then smoking them, will have their chances of getting Cancer increase. There are plenty of people who can see ridiculous images of impossibly perfect women in magazines and not be affected, they can hear diet campaign after diet campaign and think nothing of them, but there are more people who will take notice and who’s self-esteem will be impacted. Negative body image doesn’t always result in an eating disorder, but it does result in time wasted judging and disliking ourselves. Cigarette ads don’t cause Cancer, yet they’ve been removed from our magazines and TVs because they glorify dangerous behavior, well so do photoshop, airbrushing and our insane adoration of emaciated bodies and wrinkle free skin. Eating disorders are complicated, insidious and unrelenting. They are far more difficult to understand than most people realize, which is why I don’t believe that the media causes us to get sick, but the absurd and harmful ideals it insists on perpetuating, keeps us that way. Subscribe to comments with RSS	or TrackBack to 'The media doesn’t make us sick, it just keeps us that way.'. This is by far the best post/article I’ve read that really hits the nail on the head! I sometimes find it difficult to articulate the things I’ve learned and absorbed on my way to recovery, but this is extremely well put, and the link to smoking ads is perfect! Thank you for sharing! I’ve been hearing a lot about this lately and just felt that people really simplify how complex eating disorders are..they are about far more than seeing skinny models and diet ads. BUT, our suoer shallow society just makes things worse.